Many Reiki practitioners view the five Reiki Precepts as an important part of their daily life. Sometimes they are called the Reiki principles or Reiki ideals. It is easy to forget the principles when going about our busy lives, but when I remember, I find them really helpful for a sense of balance and mental wellbeing. In all honesty, I struggle with some of them of them a lot of the time, but as an aspiration, and particularly when used as affirmations, they are a wonderful tool for tranquility. All the versions have the same basic meaning: live in the present and be as good as you can be; regret, bitterness and worry will not change the past or alter the future: respect all people and all living things. These work really well as a way to greet the new day – a calming and inspiring morning ritual. You don’t have to be working with Reiki to benefit from these; they work with every day life in a gentle, non-judgy way. 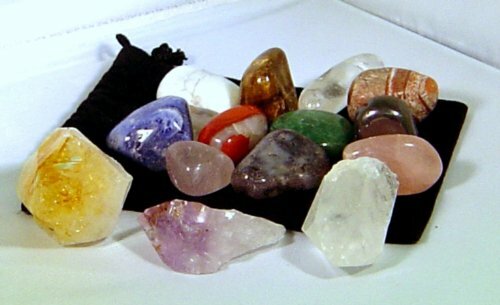 I often choose a crystal from my collection to anchor the affirmation, and keep it around me all day. You could choose one crystal per principle, or one to remind you that you are working towards all five goals. In fact, some stones seem to echo the principles very closely. A stone such as green aventurine or blue lace agate resonates with letting go of anger. Lepidolite and angelite make me think about releasing worry to the universe or the angels. Since citrine is a lucky stone, it could go hand in hand with gratitude. Apatite and labradorite work with gratitude too. Tiger Iron, ocean jasper and hematite for me are my “hard-working” stones, but sodalite is good here too, for honesty and integrity. Rose quartz, of course is all about kindness and remember that includes kindness to yourself. However, for anchoring affirmations, I don’t think the traditional meanings of the stones are important. It could even be a pebble from the beach, as long as you hold it while saying the affirmation out loud and then keep it with you and touch or look at it often. For More information about Reiki and the five principles, this is a great blog from Trudy Brookes What is Reiki? Let me know how you use the five principles or how you use crystals to anchor other affirmations. P.S. A Chakra set makes an ideal gift for someone who is interested in Reiki. We have a great quality set here with nine decent sized stones, instead of the usual 7 tiny ones. I use it as part of my own self-care and Reiki practice. Click here to view!